« I went (garage) sailing. A very long post about beds, figurative language, feminism, and a piano. Last week, I promised to show you my exciting thrift store finds. I left you with a pink ceramic deer and while I certainly found that purchase exciting—did I mention that it was only FIVE CENTS? ?—you probably didn’t. My sloppy use of semi-colons and dashes here would probably horrify many of my colleagues; nevertheless, as a graduate student in literary studies, I make my living (ahem) by analyzing language. Or, as some would say: over-analyzing. My point is that the passive construction of my statement above—that the iron bed “found a home”—obscures a great deal. Over the last week, I’ve turned my house upside-down. How’s that figure for you language types? While there was only a little bit of literal construction—and none of it involved actually moving the floors of my home—I do feel like I’ve picked the whole thing up and shaken it until all the pieces scattered across the floor. I have the bruises and scrapes to prove it. 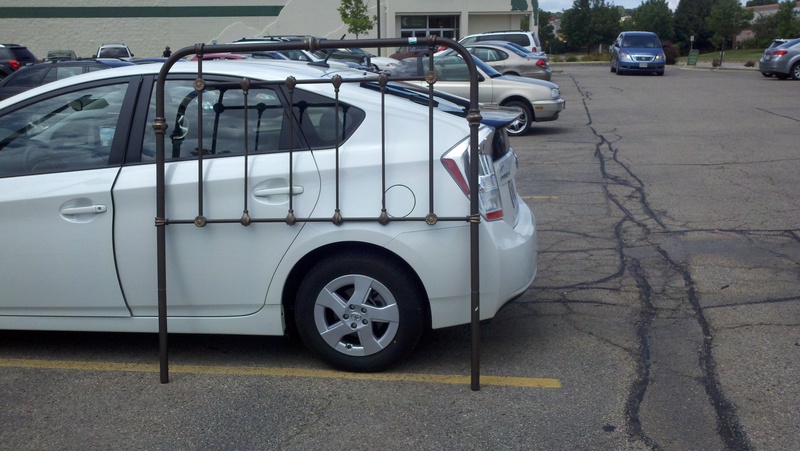 And no, that’s not the same metal bed. After years of longing for one, I found two in the same unlikely spot. I decided right away on this one, which, for $17.99, seemed like a totally reasonable gamble for the queen bed in the upstairs bedroom. After I disassembled it in the parking lot (dressed, ever-appropriately, in a nice skirt) and packed it away in my car—padding it with a bright pink vintage wool blanket that ended up being a fortuitous addition to my purchases—I decided to head back in for one more look at the other bed, which, sadly, seemed far too large to fit in my car. But it was $14.99, solid metal, and a lot older than this headboard—which, though I like it, is clearly some kind of Ashley Furniture stuff rather than the interesting old kind of thing that I generally favor. 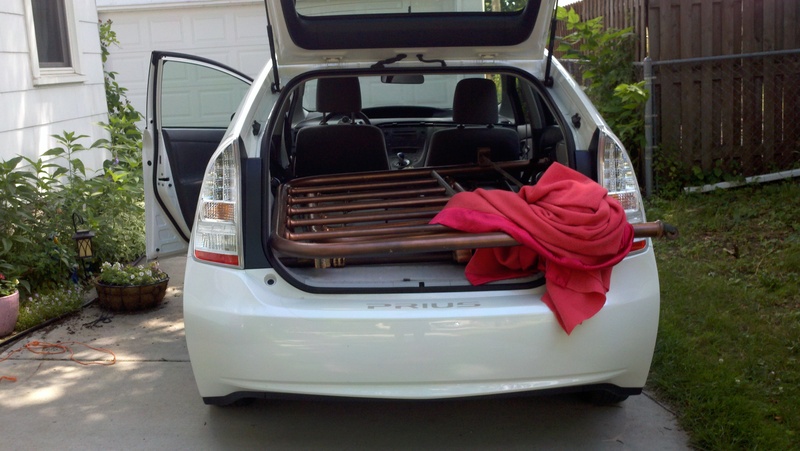 Two metal beds in a Prius. In case you’re keeping track, this is where the bruising and scraping really started. But I got them into the car and then back out again with only minimal damage to myself. And then I went a little crazy on the home improvement front and started donating, sweeping, spackling, sanding, painting, hemming, and moving everything that isn’t structural. I moved a piano. Not very far, but far enough. 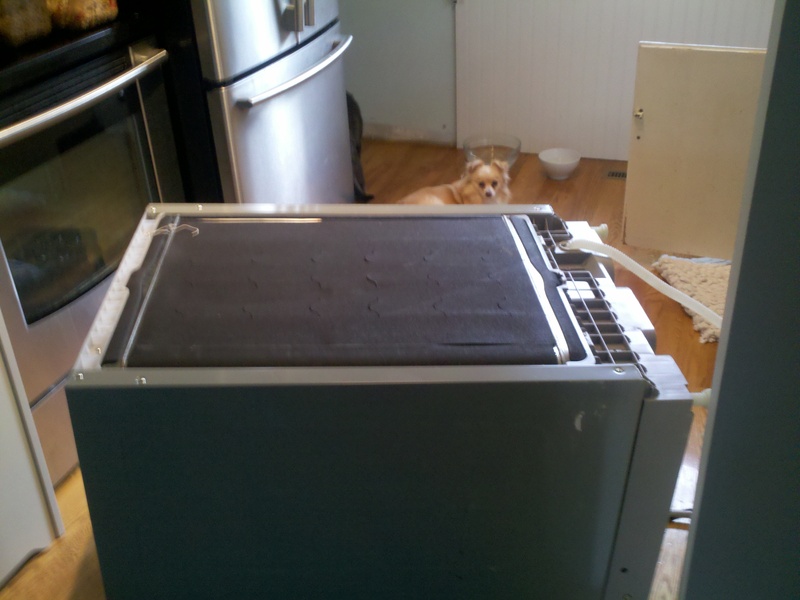 Then the dishwasher started leaking. A lot—five bath towels worth of hot water in one go. So I moved that, too, and fixed it. Maybe it’s the Wellesley talking, but I get a great sense of satisfaction from completing tasks like this without the male presence* that the fine people at Home Depot seem to think is so necessary—no, I don’t need to “ask my husband.” I don’t have one yet, and even when I do, I doubt he’ll have much to contribute to this discussion of wood putty. Sometimes I like doing everything. Sometimes I don’t. I’m the first to admit that my designer-jean-wearing/ hot-water-line-fixing feminisms are complex. The best ones generally are. 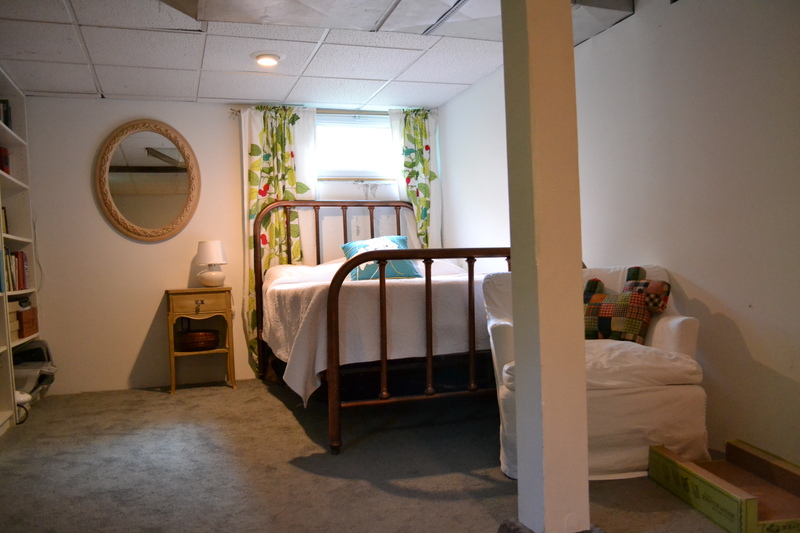 The first picture in this post is what the downstairs room looked like late last week. Soon I’ll show you what it looks like now. I might need another nap first. I like how you put an asterisk next to male presence*. Was that a reference to yours truly? If so, I feel like “male* presence*” would be more appropriate. It occurs to me that I could definitely use some female presence whilst I work. It might keep the profanity to a minimum when I rapidly and inappropriately distort my phalanges. It is altogether too bad the mostly female clerks at my local Home Despot wouldn’t think to suggest any such thing.